Enjoy the world's largest celebration of Irish music and culture on the Summerfest grounds in Milwaukee August 16-19! 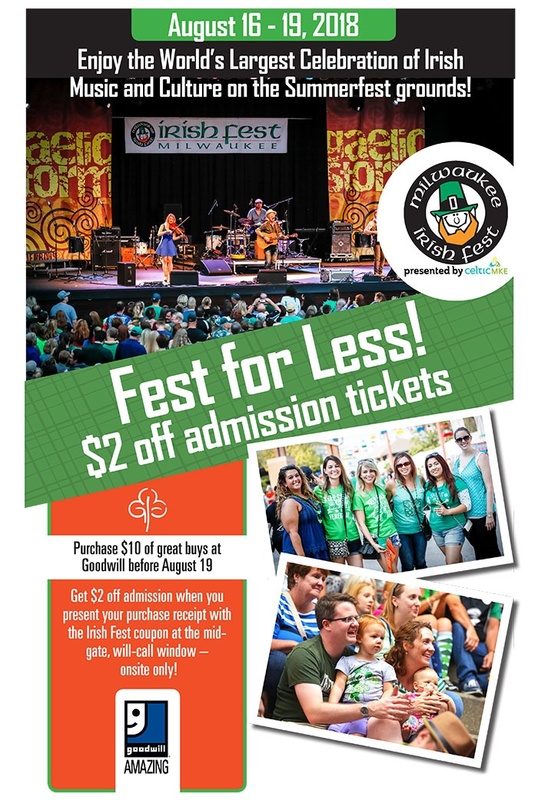 And, if you make a $10 or more purchase at a participating Goodwill Store & Donation Center between now and August 19 you'll receive $2 off admission to Irish Fest! Just present your purchase receipt with the Irish Fest coupon at the mid-gate, will-call window onsite before you enter. Your total purchase must equal $10 after all discounts have been applied and before tax. The purchase of Goodwill gift cards and round up donations do not count toward the $10 spend requirement.